Wendouree is considered by many wine lovers to be among the most beautiful and distinctive wines this country has to offer. 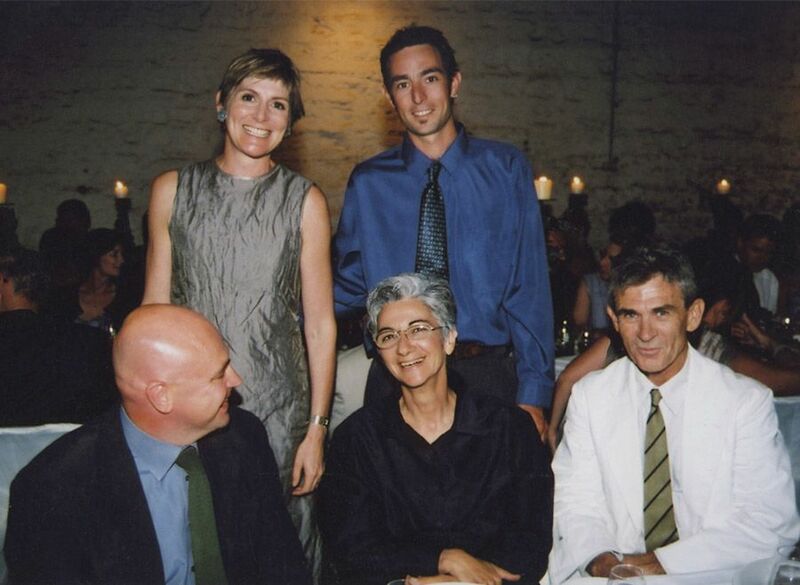 Years ago we gathered for a weekend in Mildura, with a group of our friends from the eastern states, mainly to have a night at Stefano de Pieri’s restaurant, Stefano’s. When I asked about BYO, the manager said, “we normally only allow one bottle per table sir”. I took along a magnum of 1990 Wendouree Shiraz. 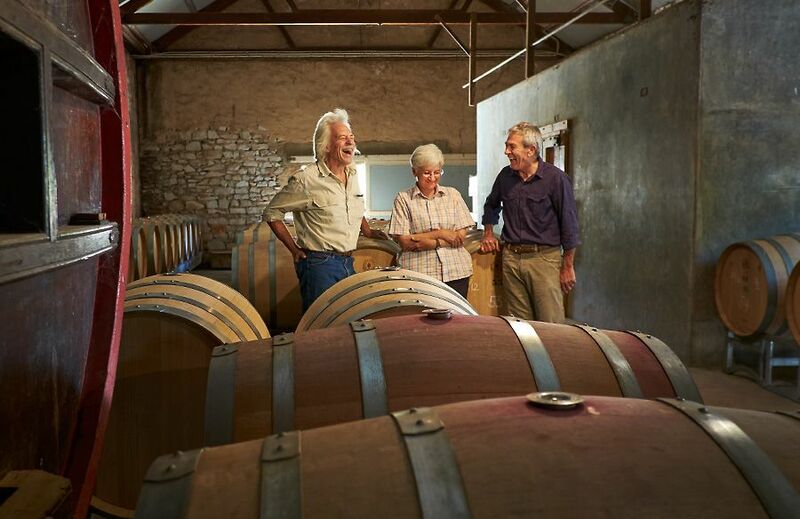 Tony Brady and his wife Lita have been the custodians of Wendouree since 1974. 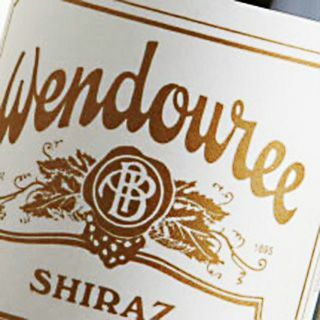 Wendouree has been producing wine for a very long time. Who originally started it and when ? Alfred Percy Birks ‘AP Birks’ started in 1892. 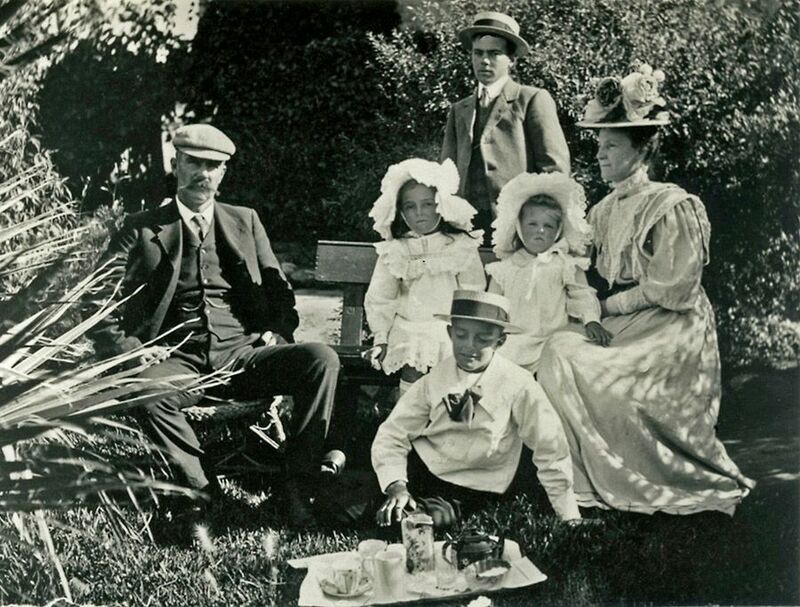 Roly Birks as a young boy with his family. Roly is on the grass at the front. His father was a medico in Angaston. AP was one of four boys. He and one of his brothers planted a 0.2-ha block of cabernet sauvignon. One of his other brothers was Charles Birks, of the Adelaide Department store Birks. There was a story that it started out as a hobby, but gee they worked hard. It’s remarkable what varieties they planted and where, just how astute time has shown them to be. We assume they had not much knowledge of growing grapes, but we forget a lot of the pastoralists in those days were Oxford or Cambridge educated. They would have been exposed to claret and drinking Burgundy, both good and bad. So they may have had more knowledge than we think. Roll on top of the ‘Giant Rock’ with A.P at Seven Hill Cellars, one of the other first wineries in the area. They certainly had more wisdom. There were only four wineries here back in the 1890s, essentially you had Wendouree, Quelltaler, Seven Hill, and the Stanley Wine company which was established in the same year as us. 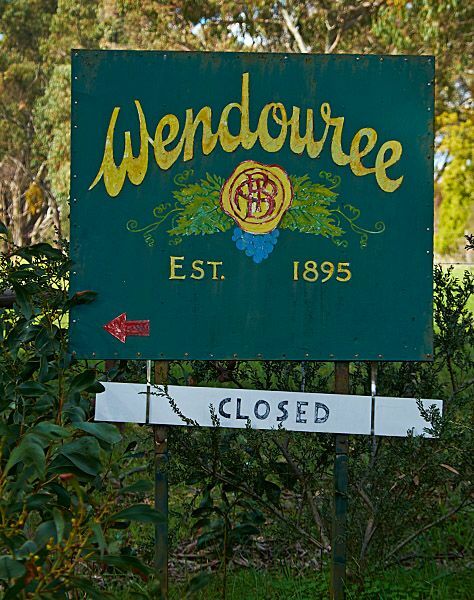 The word Wendouree is supposed to be an Aboriginal word meaning place of water. There used to be a creek here and a permanent spring and permanent waterhole nearby. They are all dry now. A very old man I met once recalls local Aboriginal people using a spring nearby. We were on the trading route between Wilpena and Port Wakefield, this would have been a significant stop off point for reliable water. 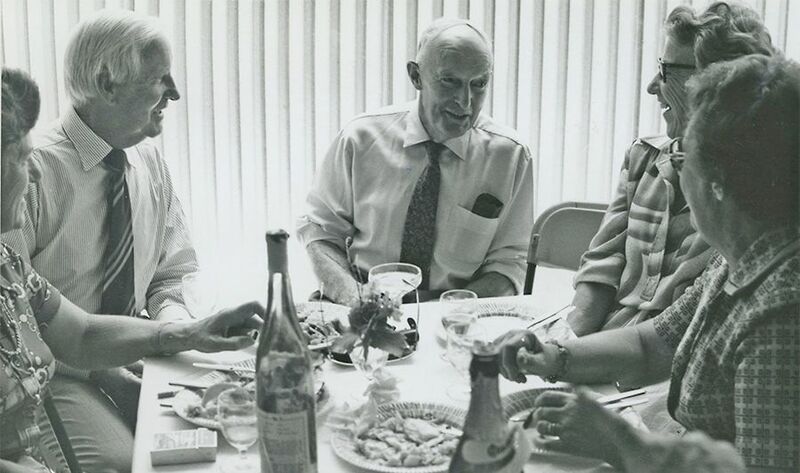 Your father-in-law Max Liberman purchased it in 1974 – what was his interest in wine ? None really, he had previously bought a hogshead of Wendouree shiraz in 1963, and bottled it with some friends. 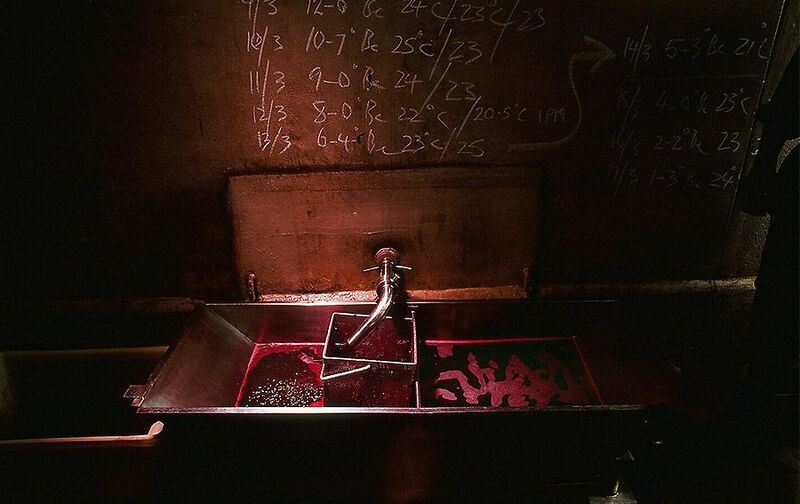 Max’s share was in his cellar in Sydney, so that was his first contact with the winery. 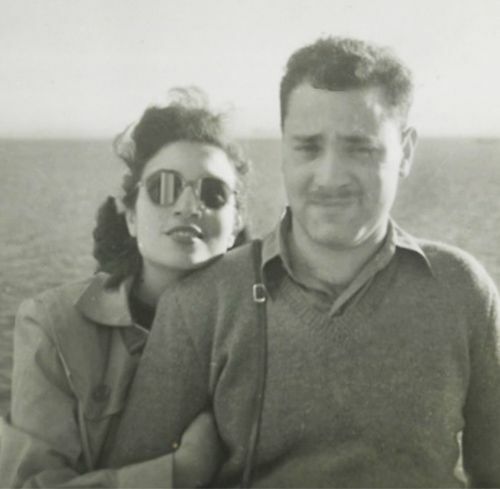 Lita’s parents, Max and Alegra Liberman on the ship out to Australia in 1947. The place was up for sale because the previous owners, the Fitzpatricks, had borrowed against it and the bank was closing in on them. It was a mortgagee sale. Max’s accountant was looking at it personally but he thought it would be too much for him. I’d just retired and Max thought I was too young to retire. He asked me to come and look at it. I said sure. “What do you think of it?” he asked…. I was retiring from academic studies, I studied law, philosophy, history. I studied in London for a couple of years, it would have been 1969-71. I was born in 43, so I was 29. He asked if I would run it for him. I was living back in Adelaide, Lita and I were married and I agreed. 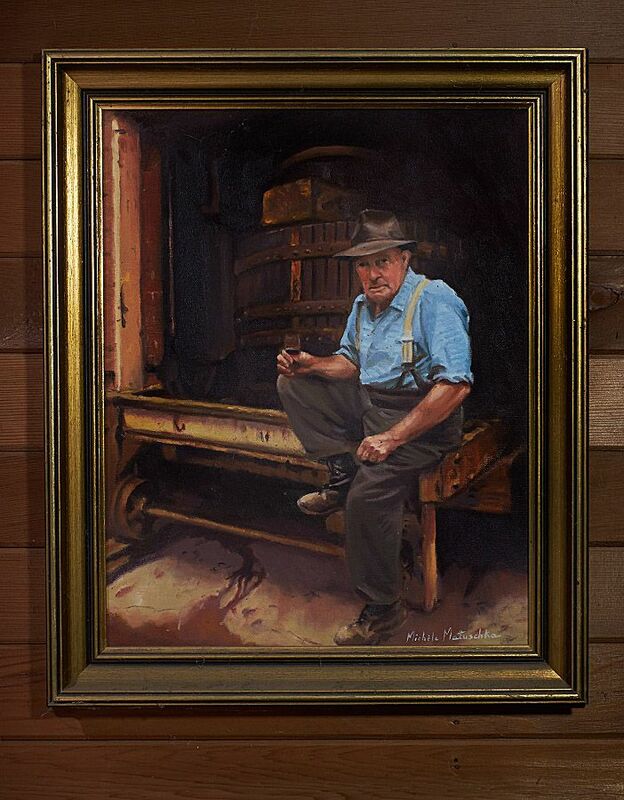 Roll Birks portrait with the Old Press (circa 1898) by Michile Matuschka. We thought we were retiring to the country. I have gotta give it to Max, one of the things he didn’t do was acquire it as a money making concern. Not that he would have objected if it made money, it didn’t for many years. It does now but that took many years. Lita did wine science and Roly Birks stayed here to help us. Max was very proud of the way things turned out. It was at odds with his inclinations elsewhere, normally in business he really liked to turn a dollar. But he really loved this place. So what was the place like when you arrived ? The crusher was Whitehill Beater so it was seat of the pants stuff equipment. 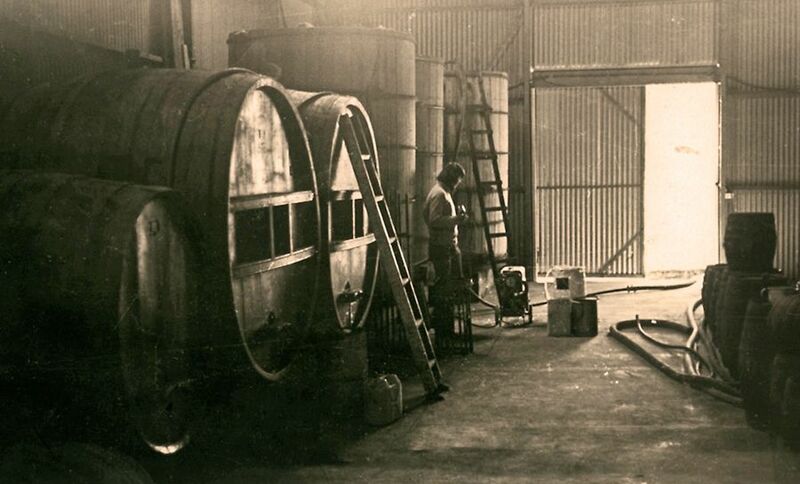 Wendouree cellars in the early days when Tony and Lita took over. 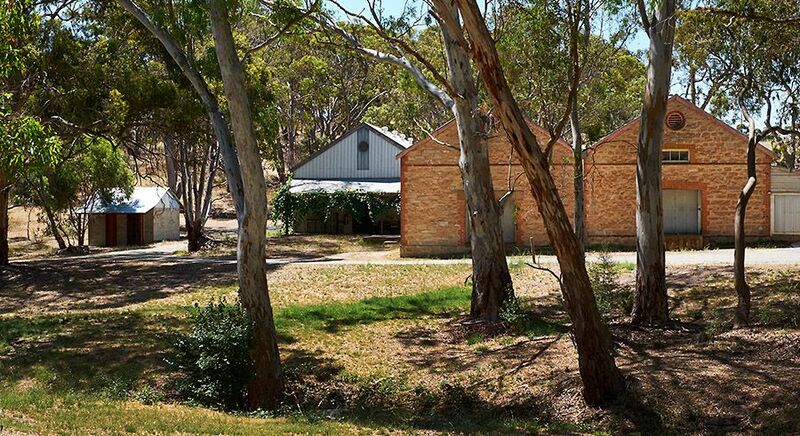 Virtually all the wine had been sold in bulk, mostly to people like Seabrook’s in the East… locally Penfolds bought some, only about 500 gallons were ever bottled under Wendouree’s own label. The vineyards had been neglected, huge erosion everywhere, the trellises had all fallen over. A 1958 Bins C14 & C16 W.J. 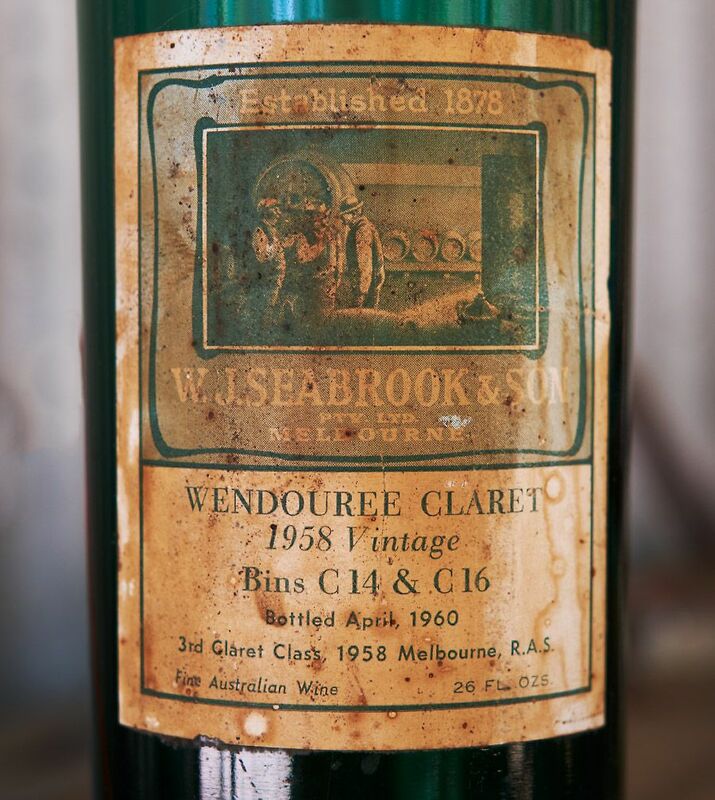 Seabrook ‘Wendouree’ Claret : Photo © Milton Wordley. We’d come here to retire with no knowledge of grapes or the wine industry and were met with a neglected winery and vineyards. The one advantage of ignorance, is that hopefully, you know you’re ignorant. The danger, of course, is that it can breed excess confidence, so Lita studied in the 80s and Roly stayed on for seven years. We worked together and got on very well…Roly was class, really agricultural but absolutely focused, this was his life. He was born at Aberfeldy House on the property, was a very good tennis player and pruned the vines all his life. He went to Melbourne once in his life…. and he never studied agricultural science. These were the days when they took tree stumps out with a stump jack and horses. What’s the story about blending with buckets ? 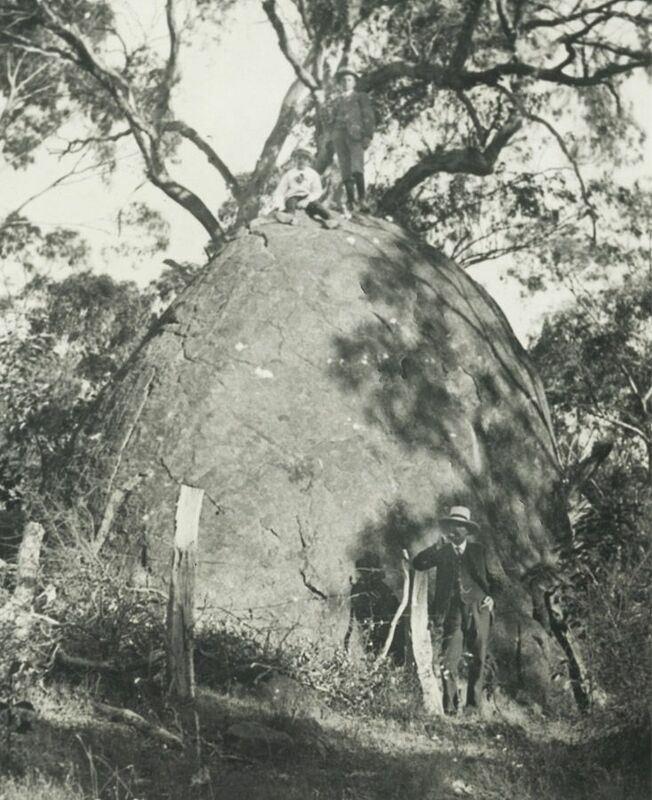 Wendouree’s 1895 grape crusher amongst the Hogsheads. 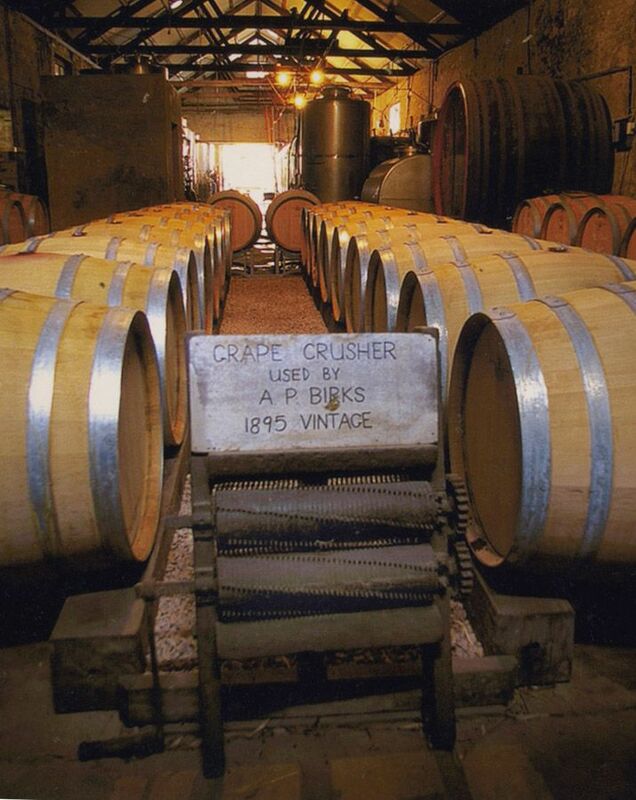 Roly blended the wine at the crusher with buckets. He did that because there was no weigh-bridge in those days, they would weigh an average bucket and that became the measure. So to maintain tradition, when we used to put on a back label, we described the blend % in buckets. We still pick in buckets but it goes into bins now. We stopped the back label because it doubled the cost of labelling. We were labelling by hand… I think we stopped it in the early 80s. Have you made any changes to the vineyards ? In 1981, before the vine pull, we took out half the vineyard. We took out what we thought were dodgy varieties like Chenin Blanc, False Pedro or the worst grape variety in the world, Cruchon. We then had serious erosion, we got brilliant advice from a guy at the Ag Department, and were able to put in strategic contour banks, without losing many rows. Tony and Dr Bob take walk between Shiraz Block 47 on the left and Cabernet Sauvignon Block 49 in the ‘Eastern Vineyard’. : Photo © Milton Wordley. We reduced the vineyard from 50 acres to 25, and halved the cost, but being completely ignorant, I didn’t do anything when we came in, I just watched. I realised early on we were not going to survive simply as grape growers; we would go broke selling Pedro to Stanley so it was better to take them out. Roly stayed on to help us and we had our neighbour, a young winemaker Chris Sullivan, helping us in the early days. He worked here from 1975 to 1980 and then he went into the earthmoving business. Philip White considers Wendouree to be amongst the most beautiful and distinctive wines this country has to offer. How do you see the style of wine you make ? The style hasn’t changed, but the equipment has. One of the features in Roly’s time, and it’s still true here today, is there are no tricks. 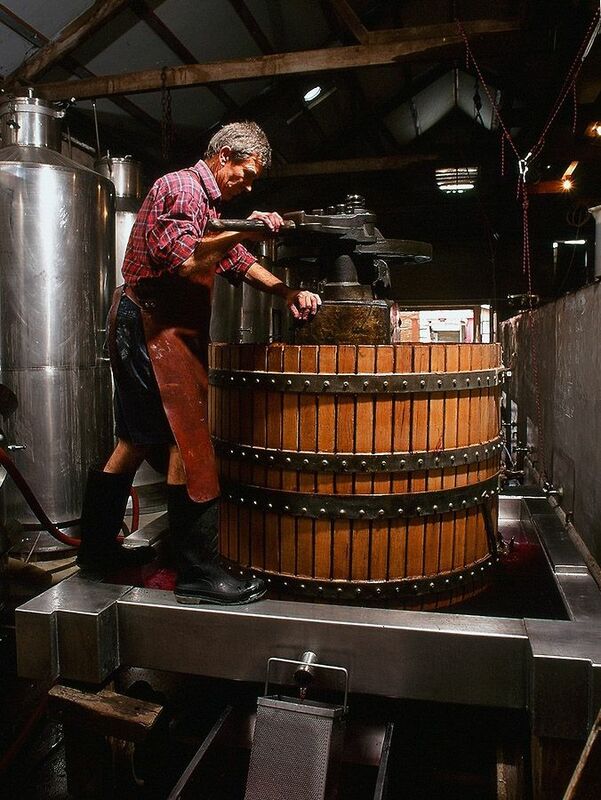 Tony Brady basket pressing during the 1996 Vintage at Wendouree : Photo Milton © Wordley. I sometimes think of the craftsman who said he had 30 years experience when he’s actually had one year’s experience and repeated it 30 times. Roy Birks celebrates 60 years of winemaking at A.P.Birks with friends, especially Bill Knappstein. 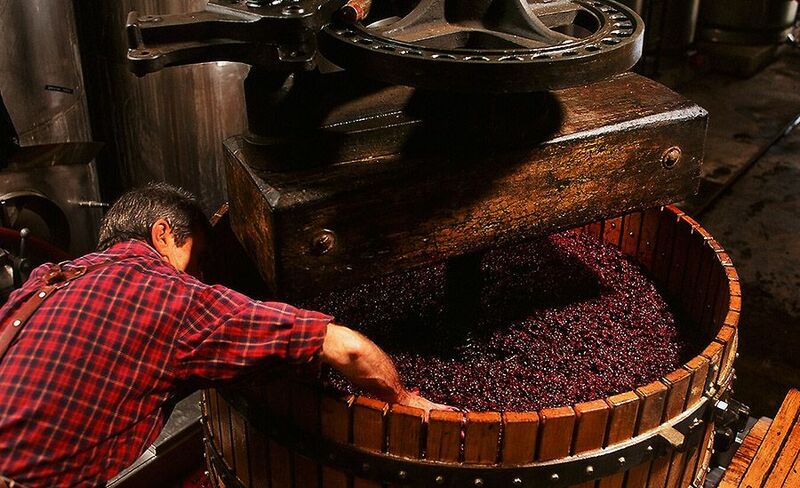 The wine is processed the same way, as it’s always been. So what the wines do is reflect the vintages, and the style reflects the site. Prior to climate change…. can you believe there are still some politicians who are ignoring the climate scientists from all over the world? When we had a Beater crusher and primitive equipment I reckon the wines were better. The climatic conditions were better. Then the wine industry went to refrigeration winemaking. When it’s really hot you can’t resist it. 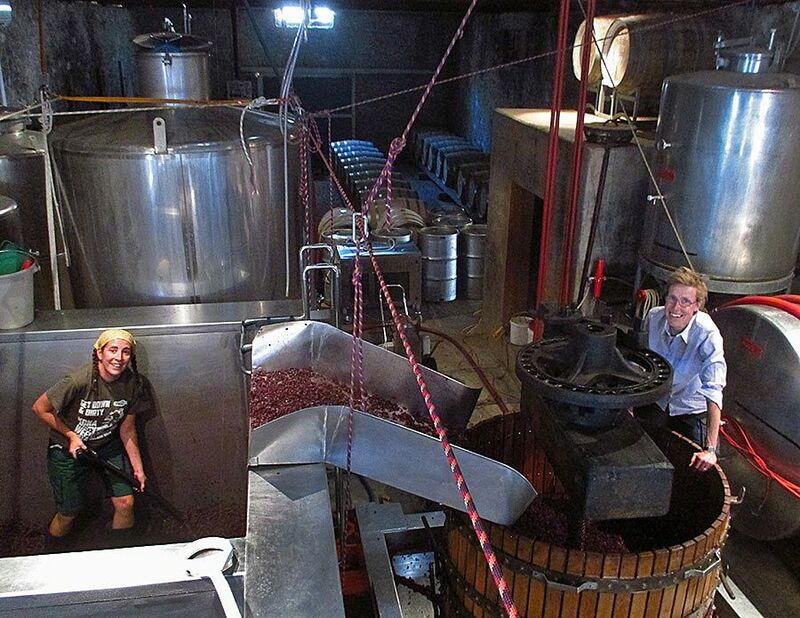 Wine making is closer to jam making, not the making of ice blocks. There was a climatic effect In the 1980’s, I thought the wines were slightly lighter except 83, they were monsters. 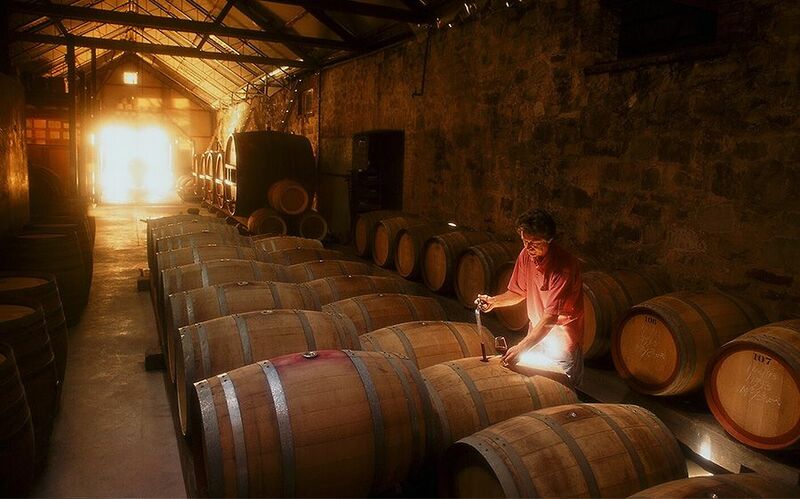 The Barrel room at Wendouree : Photo Milton © Wordley. Again in 2011 the wines will be much lighter…. sound wines but very light. A vintage like this 2016, the wines are more substantial, with more colour, more flavour, more structure and tannin. You’re not looking at changes in processing but changes in viticulture and climate. This is one of those great sites that somebody picked in 1895. Walk around the countryside and have a look at the old cottages and where they were sited, quite different from where we put the modern transportable. Wendouree Cellars today : Photo © Milton Wordley. Seems to me back then they paid more attention to detail. I remember a young Kiwi who had a lot of experience in the whole organic biodynamic thing, telling me he thought it wasn’t cow horns and full moons but the fact that people paid very close attention to the vineyard, the siting of block, the air movement etc etc. The front block of old Wendouree vines. 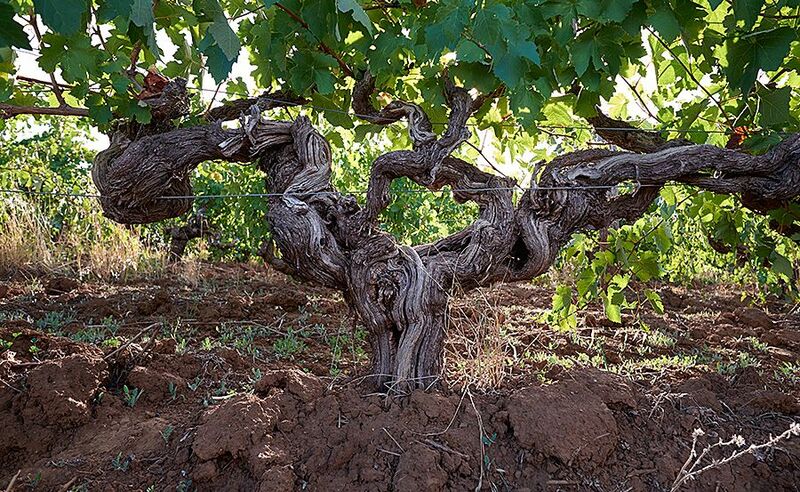 Shiraz planted in 1911, Malbec in 1989 and Cabernet in 1971 : Photo © Milton Wordley. The other thing that is impressive is that 100 years later, and climate change aside, if we were planting varieties here that have shown themselves to be suitable to the sites, we would essentially be putting the same varieties in the same sites. Is that fortuitous ? …. partly, but its also the result of paying close attention. Look at a commonplace observation, when you think about training, what you are getting really is discipline on how to think, how to apply, it’s the methodology rather than the content. Somebody told me a fascinating thing about cover cropping. We have gone back to the traditional ways, we jig and plough. The analysis shows that if you do that, the carbon retention in the ground is better than in the cover crop situation. One of the things about old vineyards, they’re much more self-regulating than young ones, you get a better, more natural balance. I’m not sure you get that with high production commercial vineyards. 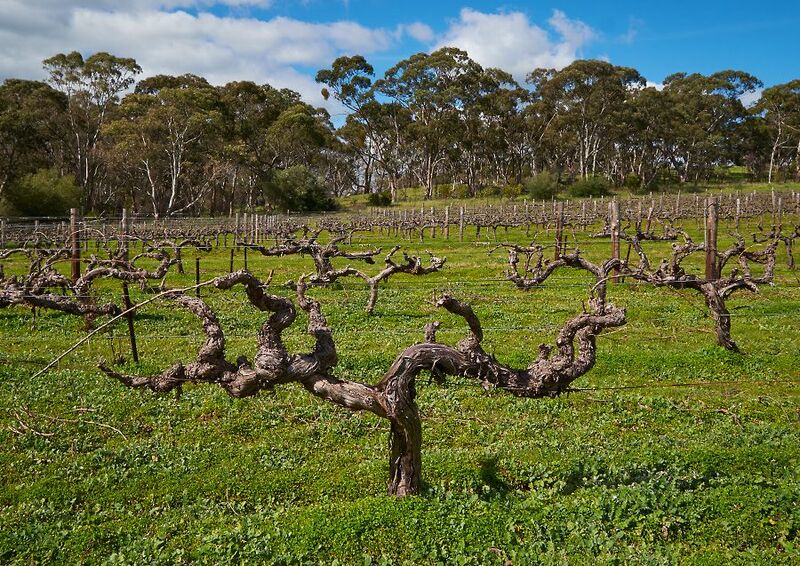 ‘Block 24T’ Shiraz planted in 1893 : Photo Milton © Wordley. The feature of the wines that come out of this place is this balance, it’s not the wine making, it’s the power and the elegance of the fruit. I believe Stephen George has been involved for many years ? When the young winemaker left in 1980, we needed some serious help. Charles Hargraves, a sparkling wine maker for one of the big companies, was living in Aberfeldy and working for Remy Martin at the time. Lita the ‘Brains’ does not seem to find what ever it is Stephen the ‘Palate’ and Tony the ‘Arms and Legs’ so funny : Photo © Milton Wordley. Now Stephen’s dad had started Skillogalee, and he had just come back from a long time travelling the world and finishing his wine course. 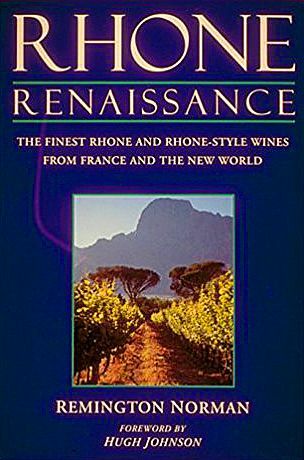 ‘Rhone Renaissance’ the book by Remington Norman. I went over to see him, and asked if he could come and look at the wines and give me some advice. That was in about 1982, we became quite friendly right away. I started off completely ignorant with no knowledge, Stephen would say something to me like “what you need here is a wood policy”. So we trashed all the big wood, distilled all the wine, and kept what was worthwhile. Some of the old 1970’s wines are magnificent, but you can see that the wood was tired. He’s got a superb palate. Blending, we don’t do a lot of blending here, we do some….but Stephen really comes into his own then. It’s the huge advantage of having someone who doesn’t have to do the work, there is no financial implications so that one can be an objective critic. 2015 Bushing King Stephen Pannell and Fiona Lindquist. Photo © Angela Lisman. Steve Pannell is a great fellow and a very good friend. I’ll tell you a story about Steve. Steve was working at Knappstein for Petaluma…they had a bit of a break during vintage and he came out here with the cellar hand… they wanted to plunge some tanks. He’s the only winemaker I’ve ever seen here during vintage, he’s a good man Steve, he’s got a good capacity in dealing with people. He is confident, but sufficiently confident not to be arrogant. 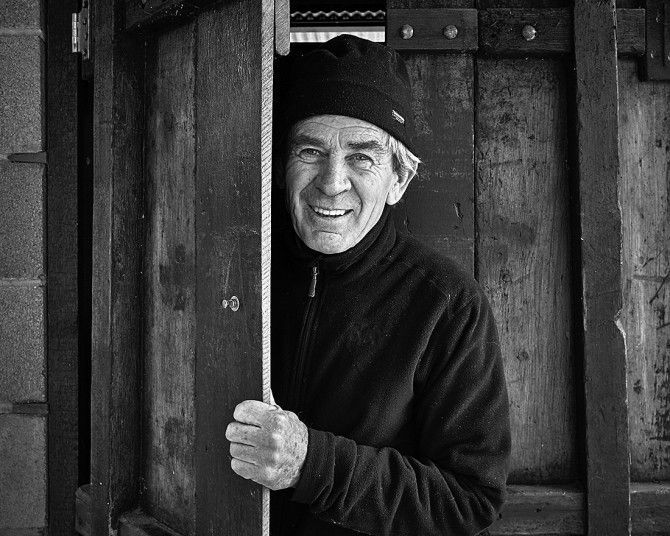 He makes the most beautiful wines. At one stage we had a very small riesling block, at most it produced about 250 gallons each vintage. Tony and Lita with Michael and Lucy Hill-Smith and Larry Chebino at Steve Pannell’s wedding . People who come here come to buy red wine. We’d open half the riesling to sell the other half, it wasn’t very economic. So I figured we would pull the block out and just do red. I also thought the world might take us more seriously if we only did red wine. When we picked the last crop in 1995, Steve made a wine which we referred to as the valedictory riesling. He processed it at Knappstein, with a PH you couldn’t believe and a high acidity… fantastic wine. He bottled it and you wouldn’t believe it, most of the bloody corks were crook. So just about every bottle was corked. I have heard you don’t actually drink much wine is that true ? I had a good friend Dave who really got into drugs and alcohol big-time, unfortunately he’s no longer with us. His father was a whiskey drinker, Dave asked to taste the whisky one night and his father told him, “You’ll never be able to hold your liquor”. Literally a couple of days before he died, he told me he showed his father he could. I said it’s funny you say that Dave, when I was younger I was at a party, there was a big cabinet full of sherry. I was interested in tasting it. Someone must have seen me, the next week I got a pile of pamphlets from Alcoholics Anonymous. I was about fourteen and when I opened the package my mother saw me and was worried. I said to my friend Dave, “I showed her”. When I was studying law Adelaide Uni the culture was a lot of drinking in hotels, I couldn’t stand the smell. So I just never drank. 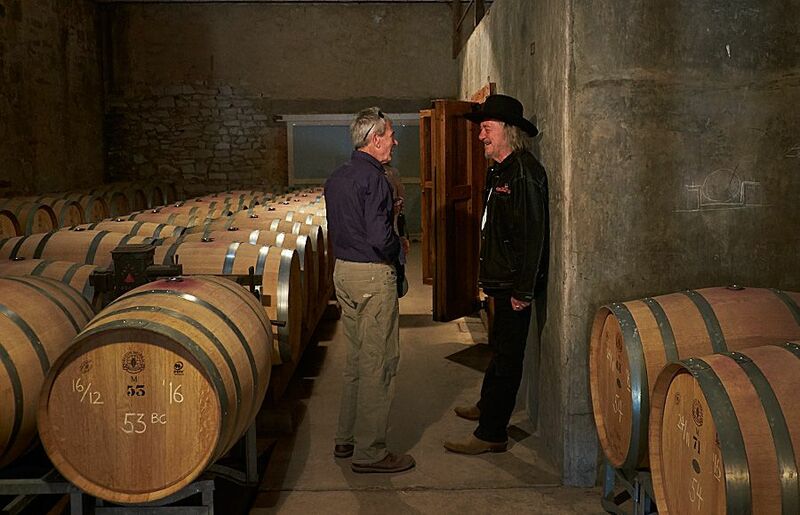 How’s it feel to be the custodian of an iconic winery ? 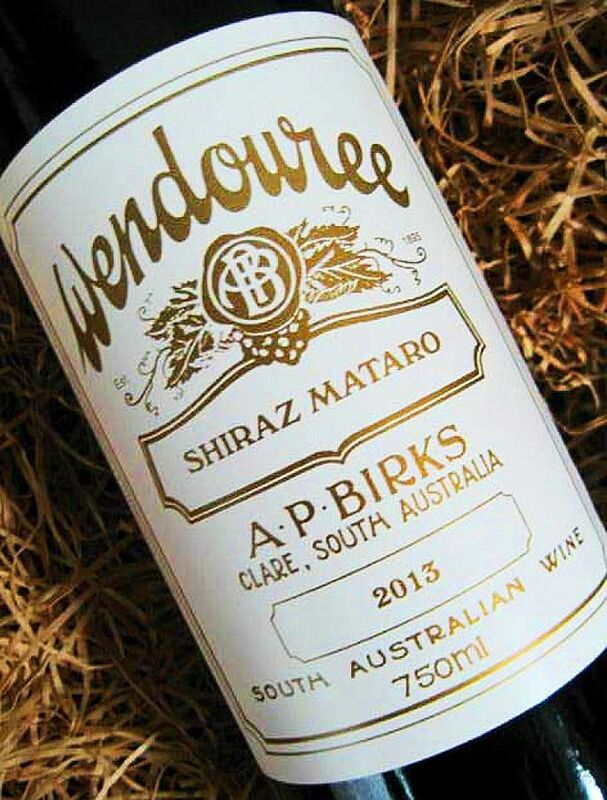 It’s a great advantage to work for a place that has tradition and lineage, because it’s not yours, I’m an employee of ‘AP Birks Wendouree cellars, that’s what I am…. an employee. Kerstin at the basket press with her partner Louise Sensi shovelling out during vintage 2016 : Photo by Lita Brady. Our swiss employee Kerstin Kothrade recently went back to see her parents. While she was there the ‘Chooky Dancers’ were performing in Innsbruck. So she took her parents along to see them. She noticed that when they dance they lift their leg up from the earth rather than banging it down. So for me it’s that thing about being immersed in place, it’s an honour to be here, it’s about lineage, it involves certain obligations. Wendouree wines are very hard to get. Photo © Milton Wordley. It’s amazing that any business can last 100 years, it’s the exception rather than the rule. Gee how things wax and wane, being here and being aware of the ‘goings on’ in the wine industry generally, I realise how important or significant a sense of place is. l’d argue that unless there is a production that is tied to a place it’s a battle. You should see the correspondence we get about wine. The wine industry is unique, we all help each other. I remember one junket with Seguin Moreau the French barrel maker, in fact it’s the only junket I’ve been on. 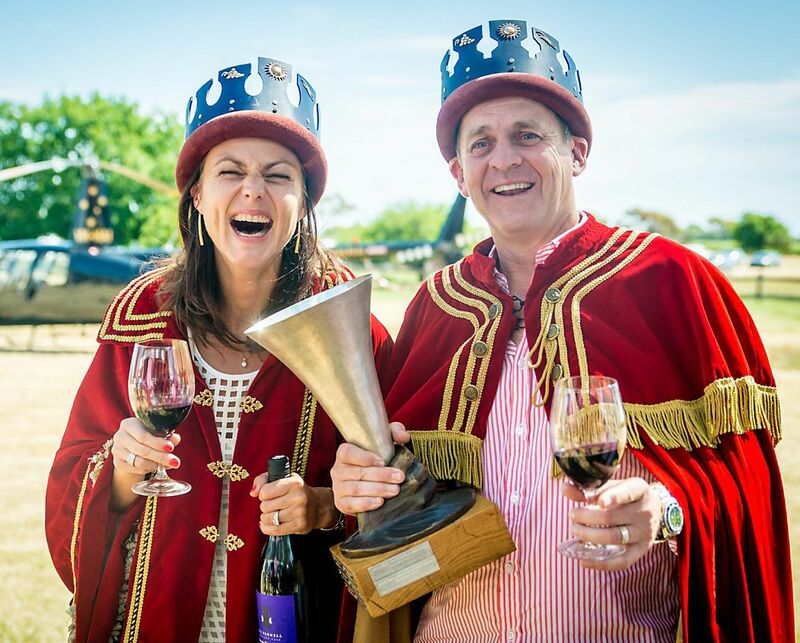 They flew us over to Margaret River, along with eight other wine makers and we met at Leeuwin Estate. We had just received satellite images of our vineyards, I mentioned it to Cartwright of Leeuwin at the time. He said satellite images of the vineyards had become critical to identifying where they were going to pick. 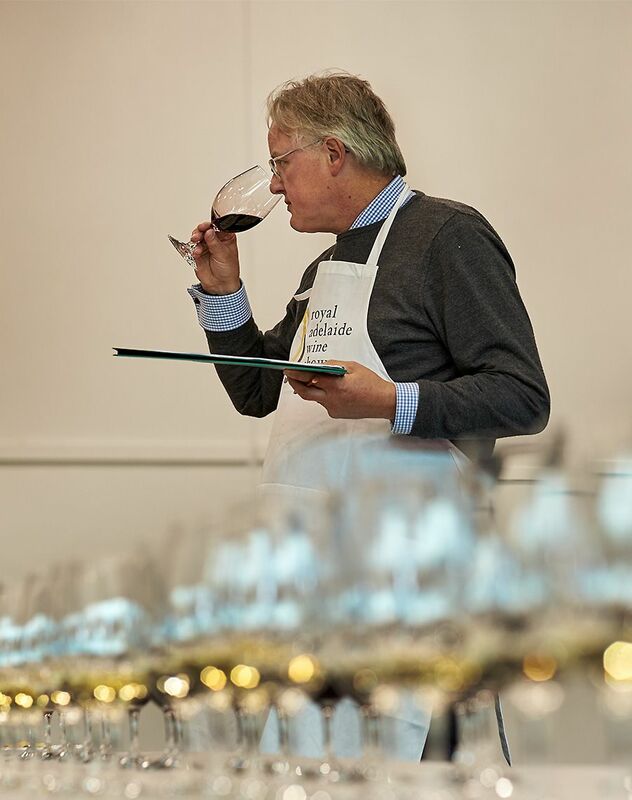 Andrew Calliard judging the ‘Adelaide Wine Show’ : Photo Milton © Wordley. Selection was a critical part of the chardonnay production. It’s a reality and so it’s nice to see your wines fetch a good price. If we have customers who are clearly only dealing on the secondary market and we know it….we will choose to sell to the consumer who is buying for themselves. Andrew Caillard has a good opinion of our wine. We’ve got five wines on the Langton’s list. I’m quite happy with that. It’s all about perceptions, but you only get good perceptions if there is some quality there. So obviously people like what we do. Andrew – I like his Mataro, last time he was here he suggested we should make a straight Mataro. I think it’s a very good variety as the temperature rises in tough conditions. We planted a Mataro block a few years back. Shiraz Mataro blend, one of Tony’s favourites. It’s not ready to use, even though it’s been 10 years. Our neighbour Colin McBride at Adelina, is using the fruit. We do use the Mataro but mostly we blend it, like in the Shiraz / Mataro, which is one of my favourites. Reading…. I do a lot of reading. Years ago being part of the 60’s generation, it might have been smoking illegal substances (hashish). 1996 Vintage at Wendouree : Photo Milton © Wordley.